I entered the cinema with reservations. The plot synopses I had come across all painted a problematic picture: An undercover agent infiltrates an anarchist cell, but soon starts to discover that things aren’t as clear-cut as she’d imagined. Ugh. The undercover operative sees the error of her ways and joins the group. The focus here is on how brainwashed she had been and how they’ve opened her eyes to the sick truth of the world. The undercover operative realises that this is just a cult of deluded people fighting imagined injustices. I completely understand why. Activism (especially of the calibre seen in the movie) is often divisive. It generates binary opposites, where you’re either with us or with them, which means that creating a nuanced portrayal within these confines is quite an accomplishment. It takes guts to steer clear of the obvious answers. Which is the strongest point of The East. The script seems to lean one way, then the other, never allowing the viewer to get comfortable on the moral high ground. At heart, it’s a film about morality where the ethical questions raised are true conundrums that had my wife and I debating energetically for the rest of the night. No light, pseudo-intellectual moralising here, The East gives us a glimpse into the hard realities that we should be questioning. Posing questions about activism and terrorism, family, love, loyalty, morality and acceptance, the film doesn’t shy away from showing us flaws in any of the characters: These people who gain complexity and contradictions as ‘Sarah’ (Brit Marling) sneaks deeper into their lives. Kudos to the actors here: the characters are well rounded and played with refreshing sensitivity. The film is well paced, effortlessly building tension and confusion while allowing characters and audience alike room to chew on the implications of events. There are a few niggling issues in the script, but these are quickly forgotten inside the unfolding drama. The writing is clear and minimal and takes elements and tropes from its genre predecessors, but mixes them in a thoroughly engrossing way. 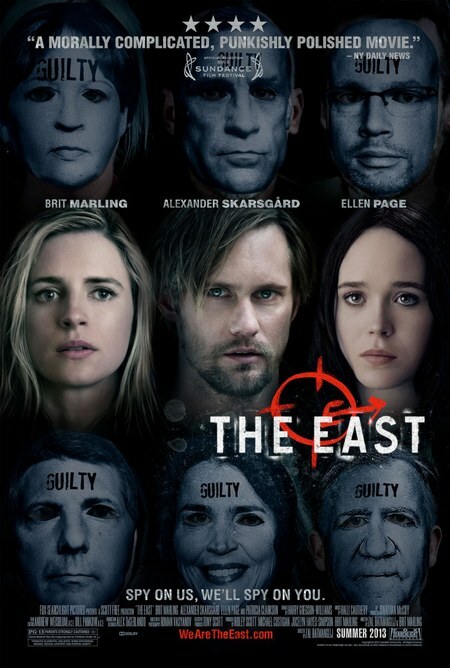 The East is a beautifully crafted work brimming with humanity, which, despite its flaws, left me thinking. And that’s the point. In showcasing the turmoil of the protagonist, we’re all forced to look at ourselves again, and in its wake, we may actually discover something new about what we believe. To love an Unfathomable God.